Machines meet Mozart in this remarkable concert by the Perth Chamber Orchestra. 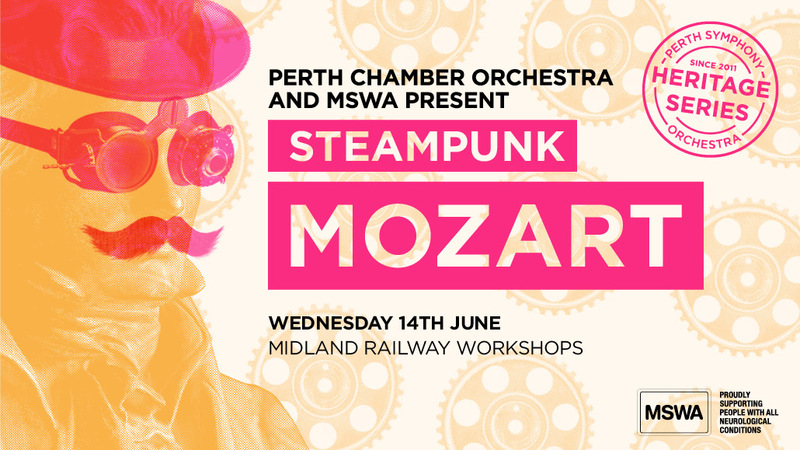 Set in the industrial surrounds of the historic Midland Railway Workshops with a visually sumptuous ‘Steampunk’-inspired theme, the orchestra will perform magical works by the master that is Mozart among the machinery and rail tracks that remain from days gone by. All tickets include a glass of wine on arrival and a complimentary plate of food in the interval. Extra food items will be available for purchase and bar provided by The Little Champagne Cart. Producer Bourby Webster, and co-Artistic Directors, Jessica Gethin and Paul Wright, have designed an immersive evening featuring highlights of Mozart’s chamber orchestral repertoire contrasted with works that bring the remarkable surrounds to life with a reference to the trains that previously haunted the building. Accompanied by a menu inspired by the vibe of the setting from the team at Academy, with beverages available from The Little Champagne Cart, the concert promises to be another indulge-all-the-senses experience like no other. Be prepared to be hypnotised by the sublime music of Mozart, performed by some of Western Australia’s most talented musicians, alongside exciting, diverse, and often surprising repertoire. In true PCO style, expect the unexpected. An evening of entertainment that will inspire and delight. We would like to thank Heritage Series co-presenter MSWA, Heritage Series concert partner Hewshott International, and event partner Barton Jones Wines for helping us bring this concert to life. Valued support also comes from Academy Cafe and The Little Champagne Cart.